Phillips & Wrinch Ltd. was a Canadian postcard publisher active in the “Golden Age” of postcards, around the years 1906-10. Its output appears to have been much smaller than rivals such as W. G. MacFarlane or Stedman Bros. However, its business model seems to have been similar to those better-known companies insofar as it supplied postcards to drugstores and general stores across most of Canada, from Alberta to Nova Scotia. 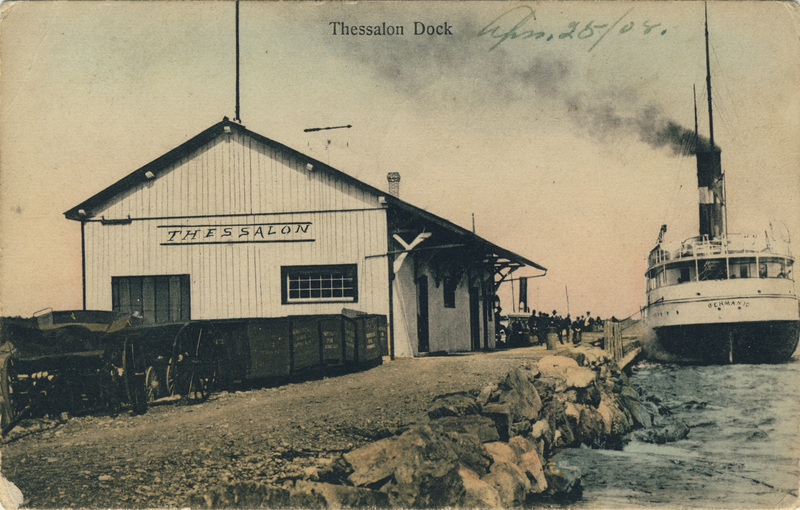 Thessalon Dock. Posted in 1908, this view of Thessalon, Ontario is one of many that Phillips & Wrinch produced of communities in northern Ontario. Based in Toronto, Phillips & Wrinch seems to have been particularly active in its home province, Ontario, perhaps most notably in the District of Muskoka and across the north, from North Bay to Kenora. The company is also known to have produced postcards of Quebec City, New Glasgow, N.S. and of a number of locations on the Prairies, including town views in Manitoba and Saskatchewan and agricultural and ranching scenes from southern Alberta. Unlike most other “Golden Age” publishers, Phillips & Wrinch is not known to have produced any patriotic or “special series” cards. Its known postcards consist entirely in ordinary local views, typically German-produced collotypes. Somewhat unusually, we know the name of the German printer that produced at least some of the Phillips & Wrinch postcards. That is because the backs of a number of the postcards display the unique “postcard vending machine” logo of M. Glückstadt & Münden, a Hamburg company that also produced postcards for J. W. Bald. The earliest postmark found to date on a Phillips & Wrinch postcard is April 27, 1907. However, this is based on a small sample and the real date could be significantly earlier. The cards are often numbered with a five-digit serial number, sometimes followed by the words “Ideal 1908” and the Glückstadt emblem. Known numbers include 25930, 31956, 32009, 33007, 35931 and 35935, so it is clear that these are the printer’s serial numbers rather than anything specific to the Canadian company. A few cards are stated to be “printed for” a local seller but this seems to be more the exception than the rule. The Toronto Public Library owns a number of Phillips & Wrinch postcards and there are also a few examples in the Peel Prairie Provinces collection of the University of Alberta. 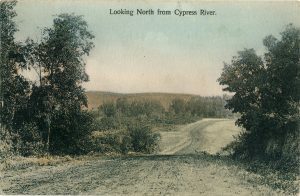 Looking North from Cypress River. Phillips & Wrinch postcard no. 32454, unused. One of a series of Phillips & Wrinch postcards from this village in southern Manitoba. Phillips & Wrinch seems to have existed since the mid-1890s. It apparently began as a partnership of Charles Phillips and Warwick Wrinch (1870-1944) and was subsequently incorporated in 1903. It was located at 8 Wellington Street West in Toronto, where in the city directories of the initial years of the 20th century it was listed as dealing in “wholesale smallwares” (similar to Nerlich & Co., which at that time was already into the postcard business, unlike Phillips & Wrinch). It should perhaps be noted that in the 1902 directory the company appears at 5 Wellington while on a 1899 cover (envelope) in the collection of TPC member Gary Peck, its address is printed as 3 Wellington. On November 10, 1907, the firm’s premises, which by that time were located in the Anderson & Macbeth Building at 76 Bay Street, were destroyed in a major fire at that address. Newspaper reports described Phillips & Wrinch’s business as “notions and underwear”. The fire might be connected to the fact that, as of the 1909 city directory, the association between Charles Phillips and Warwick Wrinch seems to have ended. Beginning in that year, Wrinch is listed as the proprietor of a new smallwares company, Wrinch, McLaren & Co., at 63-71 Wellington St. W., while Phillips continued to be president of Phillips & Wrinch at 25 Wellington St. W. By the time of the 1912 city directory, in which it does not appear, Phillips & Wrinch may have ceased operations. Information about the firm’s principals is as follows: Charles Phillips resided at 604 Spadina Avenue while the company was active but otherwise left little trace. It appears he may have held other sales positions after the demise of Phillips & Wrinch, but this is not clear. Warwick Wrinch was born November 17, 1870 in Tendring, Essex, England and died on November 4, 1944 in Lambton, a town that is now part of Etobicoke in west Toronto. He married Grace M. M. Gearing of Picton, Ontario, on June 26, 1901. He was a brother of well-known Canadian painter Mary Wrinch (1877-1969). Error: Error validating access token: Session has expired on Friday, 12-Apr-19 20:21:58 PDT. The current time is Friday, 19-Apr-19 21:57:50 PDT.